One of the largest health-based not-for-profit organizations in Calgary, desnoyers-schuler collaborated in branding their organization in a facilitated process, a first for this 100 year old organization. Over 150 stakeholders were consulted. 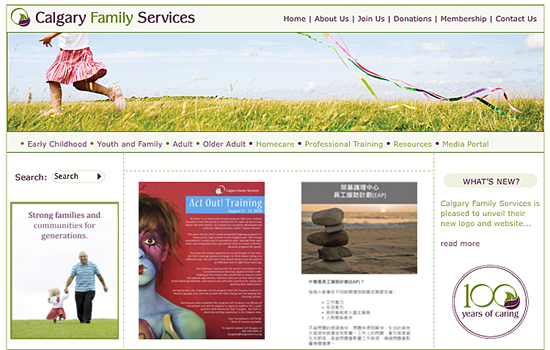 With an extensive diversity of programs and partners, the brand is applied on hundreds of internal and external promotional materials, and the website was designed for in-house updates by Calgary Family Services staff. Desnoyers-schuler continues to work with Calgary Family Services on a number of engaging events and media relations to celebrate their hundredth year.